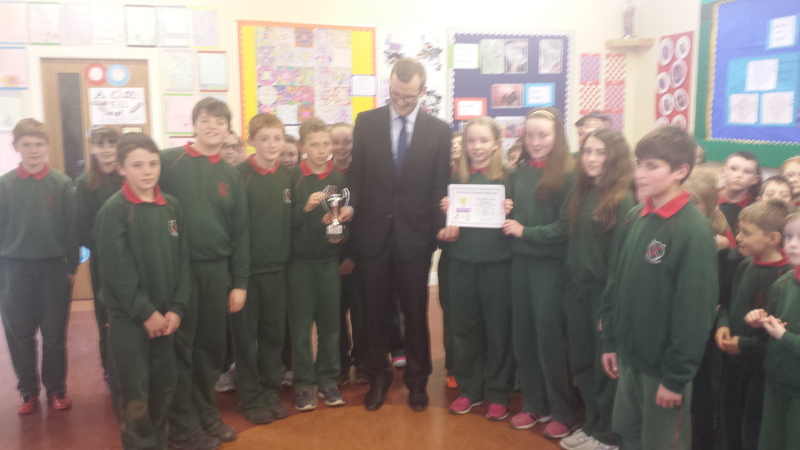 We were delighted to welcome John Paul Phelan (TD Carlow/Kilkenny) to the school last Friday to make a presentation of our MATHletes award to 4th, 5th and 6th class. 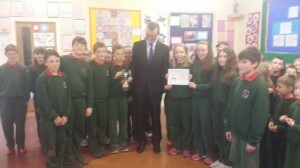 The senior classes won the MATHletes school cup for January in the primary division points per eligible student category. MATHletes Challenge is a free national tournament attempting to transform how we learn and teach maths in Ireland using Khan Academy. The students log into Khan Academy every day for a short period in school and also work independently at home. We also have children from 4th, 5th and 6th class in the top 10 in Ireland on the MATHletes challenge individual leaderboard. It really is a great achievement to have so many doing so well for such a small school and great credit must go to all the children and their families for the work they are doing at Maths. We entered MATHletes as part of our efforts to promote numeracy in the school and to date it has been a huge success. More pictures from the day are available to view under the Gallery tab of the school website. The school is now accepting enrolments for September 2015 and the school can be contacted on 0567767490 for application forms.